Donated clothing in our Wings Frazer office. Donating women’s clothes and accessories to Wings is an important way to support our organization. 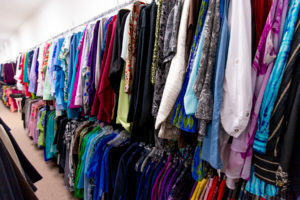 We appreciate and depend on the generosity of our community to keep our closets full. Because of the nature of our program, we need to adhere to standards that will allow the women from our community to present themselves for interviews and employment at their best. We are in need of quality clothing in current styles, both professional and business casual that are new or like new condition, that follow our preferred standards. Please note that the majority of our clients are between the ages of 22 and 35. Even if you have donated in the past, please look over our donation standards and current needs. Please note we are currently not accepting winter clothing or coats. Please place clothing on hangers or folded neatly in re-usable shopping bags that we can re-use for our clients. Accessories & jewelry may also be placed in reusable shopping bags. We prefer that donations are not delivered in boxes, large plastic trash bags, or bins. Also, please do not bring shoes in shoe boxes. If have a large quantity of clothing to donate to Wings that follow our preferred standards, please contact us prior to drop off. Email us or call our Frazer office at 610-644-6323 ext. 1. We are often approached by community organizations and businesses asking how they can help as a group. One of the most popular choices is to host a drive. Drives asking for specific donations of new and like-new jewelry, scrubs, coats and toiletries have been popular with groups. If this is something you’re interested in organizing with your group or business, please email us or call our Frazer office at 610-644-6323 ext. 1 to contact us prior to planning your collection. Donation days are held once per month at our Frazer office, on the second Saturday morning from 9am-12 noon (you do not need to make an appointment to donate during our Saturday donation day). Tax receipts are available at the time of drop off. Please note, we may have to cancel or change our donation day due to inclement weather during the winter months, in the event of a cancellation, check back for updates on a rescheduled date. If you haven’t already, please read the information above for our donation standards and current needs and visit our events calendar for our upcoming donation day dates. Our Kennett Square office is only able to take limited donations and by appointment only. Please call 610-644-1446 or email us to inquire. We are unable to pick-up donations with the exception of a retailer with new items. We do not accept men’s clothing. We do occasionally consign selected items that have been donated to us so that we may purchase needed items for our clients (such as undergarments as we only provide new) from the proceeds of those sales.